The Grace family currently spans six generations in Sonoma County history. It is a proud history and I hope to do it justice in the following pages. Some timeframes are covered more fully than others. The family’s departure from Ireland and their beginnings in America are a bit scant. The major areas I have covered are from the 1920’s to the middle 1960’s. My hope is that this brief narrative can serve as a basis for more exploration for someone, but if it doesn’t at least the younger generation and their children will know of the history of their family. It is a family and a history I am very proud of, and I hope I do them justice. Our history is inextricably wound up in the history and growth of beautiful Sonoma County. Read and, I hope, enjoy. The Grace family has been involved in the business community of Sonoma County for over 100 years, in groceries, farming (over two generations), beer, ranching, dairy, ice, wine, a hockey team, a restaurant, a vineyard management business and real estate. In the beginning, farming drew the first generation of Graces to Sonoma County. Thomas A Grace left Nenaugh, Tipperary County Ireland and moved to Oswego, New York in 1850 to chase the American dream. The move may have been in reaction to the Potato Famine of the 1840’s or just plain wanderlust and the hopes and dreams of a new start in America. At this time he was 32 years old. It is not known if Thomas was married to Catherine Bergen since she would have been sixteen – certainly not an unusual age for marriage at the time. She well may have met Thomas in Oswego. We do know that Catherine Bergen Grace owned property in Oswego prior to their move west. We know nothing else about their lives in Oswego other than they decided to come to Sonoma County in the 1870’s and try their luck at farming, and that they were married in the 1850’s.What drew them here I haven’t any exact answer, but the lure of the moderate climate and cheap land to farm must have entered into the equation. They started their family in Oswego with Frank P Grace as the first born in 1858 followed by Anna, Pierce, Ella, (Nellie), Kate, Joseph T. and Mary. Seven children in all made the trip to California to help their mom and dad in their new home and in their new lives. By 1880 they were living at 56 Humboldt Street, in Santa Rosa. Frank P was employed as a gardener, and he later worked for Northwestern Railroad. Anna was a cook, Pierce was a laborer, and father Thomas was a farmer. By 1900 Joseph (age 25) and Ella (age 28), and Kate (age 26) still lived at home. That seems like a normal Irish family, the kids staying at home until early adulthood-and perhaps even later. By 1900, Catherine Grace had passed away, and the family had moved to 1116 4th Street, Santa Rosa. Soon after, Ellie left the home and married, and the rest followed soon after. Ellie married James M Donahue. James died in 1926 and Ellie died in the last part of World War II, in March 1945 at the age of 72. Ironically, that was the same age at which her father and sister Annie passed away. Annie married John Hayes, who passed away in 1918 at age 58, and Annie lived on until she was 72 years old. Katie never married. She apparently lived with her parents until their death. Mary Grace died in December 1880 at age 20 and was buried at the rural cemetery. Pierce retired from the railroad business and moved to Los Angeles from Petaluma where he passed away on February 15, 1934. He also remained single. I don’t think Pierce was ever involved in Frank and Joseph’s business ventures. At least three of the siblings lived to see the development of Sonoma County in the early part of the 20th century and witness their brothers’ business successes. Frank P became Sheriff and Tax Collector of Sonoma County, and he and Joseph T owned a grocery store, a brewery, a winery, and JT became vice-president of the Bank of Italy and then Chairman of the Board of the Bank of America. He joined Ernest Finley, owner/publisher if the Press Democrat, in reviving the Sonoma County Fair and Horse Show in 1936. The January 1, 1943 Press Democrat stated, “ …It was largely through Grace’s efforts that the old fairgrounds and race track were improved, and the present modern fair plant was erected…”(Grace Pavilion was named in his honor). These two Irish kids from Oswego, New York did pretty well in their new town. They were both pillars of the community and business leaders. The Grace family started early in community involvement. There are countless immigrant stories just like theirs –the huddled masses leaving Ireland bound for the new world with dreams of success racing through their heads. Once the Grace family arrived, it did not take them long to achieve success and they definitely displayed an entrepreneurial bent early on. Frank P and Joe Grace opened a grocery store on 4th and A Streets in the 1890’s and slowly expanded into wholesale groceries and produce. According to Gaye LeBaron’s history of Santa Rosa (Santa Rosa: A Nineteenth Century Town), they hauled potatoes from Bodega for 45 cents a sack to sell in town. Prior to that enterprise, Frank and JT worked at a variety of jobs, including farming so I guess a grocery store was an extension of their experience. Metzger’s Steam Brewery was owned by the Jacob Haltiner family. Jacob Haltiner had died in 1895 and his son John took over. Frank and Joe Grace must have sensed a future in the beer business so they purchased the 10-employee brewery on February 6, 1897. Frank was Sheriff and Tax Collector of Sonoma County at the time. I don’t think it would play too well in today’s political climate to be the Sheriff and own a brewery at the same time, but it surely wasn’t a problem at that time. My mom, Emma Hughes Grace, always claimed that her grandfather Con Shea loaned the money to the Grace Brothers to buy the brewery for $6,500. That’s an interesting twist of fate since Con Shea’s granddaughter Emma Hughes married Jack Grace some 40 years later. They purchased the original Joseph Metzger’s steam brewery at Second and Wilson-only to see it burn down on May 10,1897. It was apparently insured for $6,000 and the loss was estimated to be between $25,000 and $30,000(John Burton, source). It was quickly rebuilt as a two- story brick building and reopened July 24th 1897. How this was accomplished in such a short period of time I have no idea, but part of the story, I imagine, is there was no planning department, permits, or red tape. The old, wooden brewery was replaced by a four-story brick building. The well was located between the brewery and the Santa Rosa Creek. Later, this well was utilized by the city of Santa Rosa during the drought of the mid 1970’s. (Rumor has it that the quality of water immediately went up). When the brothers rebuilt the brewery, they updated it and added a new power mash machine and new steel cooler, plus a first class ice machine, new fermentation tanks, and brew tubs. These improvements allowed them to brew fifty barrels of beer a day, compared to the Metzger brewery which brewed 78 barrels of beer a week just a few years before. They also intended to brew lager beer. To lager means to store: therefore, the beer must age 4-6 weeks before going to market, and this involves time and money, but the lager beer appealed to a wider audience. Steam beer is similar to ale in that it takes 14 days of aging before it is ready to sell. The quality of beer produced at this time across the country varied widely in quality and in taste. The making of lager beer was a big step in increasing the quality and quantity of Grace Bros Beer. The brothers soon added a wood frame building for making barrels and wooden beer boxes. Beer came in full keg and one-half keg and the boxes had the ubiquitous brand of GBB Company on the sides. A bottling plant was soon added. The dark amber bottles with porcelain tops were also embossed with GBB Co and Grace Brothers’ Brewery. These came in three sizes- quart, pint and half pint. The half pint was usually sold in saloons and used as a “chaser” as in the saying, “Barkeep, whiskey with a beer back”. Beer was delivered to hotels and saloons by horse and wagon. The driver was responsible for his horse and his wagon as well as the sale of his beer to hotels and saloons. On the wagon he had tapping equipment, plus tools to repair the wagon. The brewery also shipped beer by train. Business was good, and the brothers continued to expand their marketplace. They reinvested part of their profits in Kroncke Park, located next to the old Safeway store on 4th Street where College Avenue meets 4th. They renamed it Grace Brothers Park. There is a story in Gaye LeBaron’s history of Santa Rosa of Deputy Frank Grace chasing some hooligans from San Francisco back onto the train after they terrorized local citizens after spending a Sunday drinking at Kroncke Park. I guess they must have had better crowd control when they bought it with Frank being Sheriff. They operated the park into the early 20th century. There, they held picnics and beer tastings. Many breweries across America developed parks for the same reasons and because it was thought they could convey a more wholesome approach to drinking beer than in the saloons. The workingman was seen as all too often tempted by the lure of the corner tavern and outdoor, family-style entertainment seemed a good investment and widened the market. The year of 1906 was a calamitous year in Santa Rosa with the earthquake of April 18th. Widespread destruction and fire raged throughout the city with 119 Santa Rosa residents losing their lives. The Courthouse was lost along with the Hall of Records, a couple of hotels, a theater, banks and other buildings. Somehow the brewery survived the quake and the fire Amazingly the brewery had its own fire-fighting equipment, and the fire chief told the public to call Grace Brothers’ brewery phone number (Main 113) in case of emergency if they couldn’t contact the local fire department. Obviously, the brothers had learned their lesson in the 1897 fire that leveled the brewery. Remember, in 1906 Santa Rosa was just a small town of approximately 7,000 people, and city services were not what they are today. Yet, it is interesting to note that the Grace Brothers’ well and the firefighting equipment and men were instrumental in dealing with the tragedies of the quake. This is another example of the Grace Brothers contributions to Santa Rosa that began when Frank P Grace became sheriff in the early 1900s (This tradition of community involvement continued into the 1960’s with Tom Grace’s involvement in many community activities, and the brewery hosting to many Santa Rosa groups and functions). As Santa Rosa pulled itself from the ashes and rubble of the 1906 quake, business went on where and whenever possible. The town rebuilt itself and the brewery expanded. Shortly after 1906, the brewery began using paper labels, according to John Burton, Grace Bros Brewery authority, and Frank and Joe Grace converted the bottling line to caps instead of a porcelain stopper. Certainly, the bottling line process and the caps sped up bottling and lowered costs. The bottle was filled and then passed onto a pad where a depressed floor pedal sealed the cap. This modernization was typical of the brewery’s operation through the years as it tried to stay ahead of demand, raise efficiency and cut costs. The period from 1906-1918 was a time of brewery growth and land acquisition. The Grace Brothers added to their holdings and continued to supply beer locally and to ship it by rail. Another fire occurred in 1911, but the brewery’s fire squad at the quickly put it out, and beer production was not stopped. During this time, the brothers acquired large tracts of land throughout Northern California where they grew hops, barley and rice. Brew masters changed in 1913 when George Gernert died and Jacob Blum took over. Jacob had been with the brewery for about ten years and stayed on with the brewery until 1933. He died just after Prohibition was over and beer production was resumed. Later Oscar, his son, became brew master and was there when Jim, John, Bill and I worked there. The first decade of the twentieth century must have been a grand time to live in Santa Rosa with a population of approximately 7800 people, and to witness Santa Rosa’s emergence from a farm town into a city, and the brewery served as an essential part of that growth. However, there was real trouble brewing in the not too distant future as the Temperance movement gained a strong foothold on the nation’s conscience. All alcoholic beverages were seen in the same light, and no argument about beer as a drink of moderation could hold off the anti-drinking movement. 1918 opened a far different chapter for the brewery and for the country. The anti-alcohol voices were gaining momentum, and the tide was turning against the production of alcoholic beverages The concern of the movement was the affect of strong drink on the family, and that it robbed the working man of ambition and work ethic. This movement was usually called the temperance movement as in the Women’s Christian Temperance Union (WCTU) and the Anti-Saloon League. The Drys succeeded and the nation’s states passed the 18th amendment, the Volstead Act, and the United States became a dry country and Sonoma County a dry county. Everyone knows from his or her history class and popular lore this law was unsuccessful and that a reign of crime and terror swept the nation. The affect on Sonoma County was relatively benign from a crime perspective. Certainly there were bootlegging operations that existed in towns and in rural areas, but law enforcement took a more lax approach-particularly as time went on. Speakeasies were busted but reopened the next day. Homebrew and homemade wine (often called Dago Red) was widely produced. People certainly did not stop drinking alcohol, and Prohibition may have made drinking look more alluring. I’ve always had a feeling that a few bottles snuck out of the bottling plant with a little more octane in them than was allowed, since the five boys of Frank and Pearl Grace–Moses, Jim, Tom, Jack and Bill–kept a sort of speakeasy going in the basement of the house at 825 MacDonald Avenue for their friends (Cathy Grace Hayes found evidence of this in the basement years later). I have always assumed there was a little beer going around, but in reality, it is a bit difficult to brew a small batch of beer at a commercial brewery without a whole lot of people knowing since beer in a commercial brewery is brewed in vats that hold thousands of gallons. However, another reason for the basement hangout was that their mother, Pearl Cockrill Grace, did not allow drinking in the house, so her sons evidently relied on invention to circumvent her dictate. Bill Geary, today a local attorney, lived across the street, and he told me recently that Mrs. Grace was the sweetest person you would ever meet and that the boys all respected their mom. He confirmed that she tolerated no drinking in the house. He did say that on Saturdays the boys would bring a case of beer over to his house and his dad, Judge Donald Geary, would join them for a beer. This would have been after Prohibition ended. The ice, dairy products and soft drinks enabled the family to prosper during the 1920s. Frank and JT kept the business side flowing, and the brewery produced a variety of income-earning items. Money came in, and the five sons of Frank P attended and graduated from Santa Rosa High School. The brothers’ dates of birth follow: Frank, the oldest, was born in 1903, Thomas in 1904, Jim in 1906, Jack in 1908 and the youngest, Bill, in 1911. Santa Rosa was a growing town in 1920 – the population was 8,758 and still a largely rural town. Can you imagination a small town like Santa Rosa with a family of five boys, perhaps given a generous amount of freedom from what I have gathered, and the havoc they might have wrought on the town? Fortunately for the town they were involved in athletics and kept busy during the school year. Or at least some were. As I perused the Santa Rosa High School yearbooks for 1921 to 1931 I discovered a number of facts about the five brothers. Tom Grace and Bill Grace apparently were the best all-around athletes. Tom and Bill and Jim were All-Star sweater winners (called white sweaters in 1950’s and 1960’s). Tom was not only an All-Star, but he was the first president of the newly formed Block S Society. Tom seemed to be everywhere in his senior yearbook. He played football with the great Ernie Nevers (Nevers Field, SRJC, Stanford, NFL, etc) on the 1920 team and they both matriculated to Stanford where Ernie went on to star in several varsity sports and Tom played on the varsity basketball team. At SRHS, Tom played end on the football team, captained the basketball team and played first base on the baseball team. It was said that he could play anywhere on the field but was usually at first base. Tom’s last will and testament in his senior yearbook included this remark: “I, Tom Grace, the Apollo of the departing senior class, leave my sterling character.” Little did he know that 45 years later, upon his death, there wasn’t a soul in Santa Rosa that would utter a bad word about him. All my life I have heard nothing but kind praise regarding Tom Grace. He was called a gentlemen’s gentlemen, a kind man. It was said that he never would say no to anyone. So I guess Uncle Tom did leave his sterling character to the whole town of Santa Rosa. Frank (Moses) was the oldest child, though he graduated a year after Tom–1923. His ambition listed next to his yearbook photo was “to finally graduate”. In that era there was no arbitrary age limit for high school attendance, and the California Interscholastic Federation (CIF) apparently did not have eligibility rules regarding age because Frank played on a number of teams as a tackle in football and played baseball over a five-year period. During his last year at SRHS, 1922-23, he managed the football and track teams. It was not unusual in that time period to take time off from school to work on the farm or help out at home, and that may have been a factor in Frank’s tardy graduation. Or, school might have bored him. At any rate, after high school graduation until 1940 he worked at the ranches, primarily at the ranch at the end of Grosse Ave. I assume he was called Moses because he played for so many years and managed so many high school teams that they referred to him in the yearbook as the “old man,” hence, the name Moses. During Frank’s junior year, SRHS won the North Bay League championship in football but then was nosed out by Berkeley for the C.I.F championship by a score of 82-0. So, when Frank graduated in 1923 that left younger brothers Jim and Jack as the remaining Grace boys at Santa Rosa High School. “Genial Jim Grace” was an all around athlete who was awarded his All-Star sweater for lettering in football, basketball, baseball and track. He was also sophomore class vice-president and wrote for the Echo, covering sports. Like Tom, he was a first baseman and played forward on the lightweight basketball team and later the varsity. In addition, Jim lettered in swimming. In the spring of 1924, two Graces scored in a track meet. Jim in the javelin and Jack in the shot put. Like Tom, Jim was very involved in the school. He sang in the men’s glee club and seemed to be everywhere on the campus. In fact, Jim and Tom were very similar looking, as were Frank and Jack. During the twenties, at least one Grace attended SRHS and competed on multiple athletic fields. After Jim came Jack, and he also was a good athlete. I realized, much later in life, that Jack, my dad, transferred to and graduated from St Mary’s high school and attended St Mary’s College where he played one year for the coaching legend Slip Madigan in 1929. Coach Orb Fortier, a beloved SRHS coach from the 1925 to the late 1940’s, told me that Dad once sank a shot from half-court to win a game. He also was an excellent golfer in later years. Jack played end in football during the fall of 1924 at SRHS with his big brother, Jim. He started some games and subbed in others, according to the Echo, the SRHS yearbook. The team beat St Helena 141-0, a national high school scoring record, in one of those games. Both brothers lettered though it was the only year Jim played football. Jim also set an NBL record in the javelin. Jim graduated in 1925. Many years later my brother John and I played football together on the very same Nevers Field. We also played basketball and competed in track on the same team. Bill Grace was undeniably one of the greatest athletes to “grace” (pun intended, sorry) the campus of SRHS. Bill played from 1927-1931. I think he competed in and lettered in five sports in 1930–golf, tennis, football, basketball and baseball. I believe that Bill Grace was one of very few SRHS athletes who accomplished this feat. The Press Democrat said, in his obituary, that he competed in six sports-a record never matched. He was captain of the basketball team in 1931 and was an all league selection in football that year. The football team won the NBL championship, outscoring opponents 210-59. Their only losses were to non-league teams. It was the school’s first championship since 1923. (Read the attached article from the Press Democrat on the “The last of the five Grace Brothers”). The boys continued sports after high school. Tom played basketball for Stanford, and Jim made the UC Berkeley varsity basketball team in his sophomore year. Both Tom and Bill played American Legion ball after college. So, counting Jack playing at St Mary’s, three Grace Brothers played at the collegiate level–not bad. Bill Geary said his uncle, Finlaw Geary, a great friend of the Grace family and their attorney, told him the boys played on an AAU team together, and that it was a dynamite basketball team. This must have been in the mid 1930’s. Since both Tom and Jim had college experience and since Bill was such a great athlete, it seems only natural they would play on AAU teams or other local teams. The brewery did sponsor a Blue and Gold AAU team in the 1940s and early 50’s that was very successful. Bill played for the Blue and Gold team for a few years. There are 16 mm movie pictures of Tom hosting the team and their families in his backyard. On August 6 of 1930, Frank P. Grace died, and Frank P. Jr, known as Moses, became president of the Frank P. Grace Company. He was 27 at the time, the oldest of the five boys. Tom was 26 and just a few years out of college (He earned a masters from Harvard in business after graduating from Stanford). Jim was 24, Jack was 22, and Bill was still in high school. The boys were thrown into a new world once Prohibition was repealed in 1933 because the big breweries took off their gloves and really never put them back on. That is not to say that the time before 1919 was bucolic, but the competition increased ten-fold once beer production was resumed. Market share, mass advertising, changing beer tastes, and, eventually, the shutting down of regional breweries were all part of the changing brewing landscape. That was, however, down the road a bit. At the time of Frank P.’s death, the Frank P Grace Company operated the ice company, the Velvet line of dairy products and ranch land. The brewery still produced near beer and soft drinks. The loss of their father must have been a blow to the five boys. Frank and Joseph T. Grace were community leaders, as well as business leaders, and Frank had been Sheriff of Sonoma County. The oldest of seven children, Frank was 72 at the time of his death. I have often wondered what it was like to be one of the boys in Santa Rosa in the 1930’s. They all were bachelors until Jack married. In 1937 and Tom followed, marrying Virginia Williams six months later. They were busy running a series of commercial businesses. It must have been a heady experience for these young men to have the responsibility thrust upon them at their father’s death. On top of responsibility came the process of re-opening the brewery a mere three years after their father’s death. To go from late adolescence to adulthood in such a short period of time must have been quite an adjustment. They had to modernize an antiquated brewery to compete in the beer wars soon to come. They experienced a real baptism of fire. As I mentioned above, I have often thought about the 1930’s and the five Grace boys running all these businesses and running around town. There isn’t a lot written about them, but I assume that Moses was apparently a bit shy but was well known and well liked. Moses made his home at the foot of what is now Grace Heights–or the Santa Rosa ranch. It was located on both sides of Grosse Ave and ran about to Thomas Drive on the south and to Montecito Ave on the west and from El Camino Drive to the top of the hill and back to the other side. I have heard Moses described as reclusive and a large, kindly man always dressed in his overalls, with a jug of wine close by. He apparently grew a variety of vegetables because Mom said he always made sure she had her fair share of the vegetables after she and dad were married. Moses never married and passed in 1940–far too young at age 37- from a stomach hemorrhage-despite receiving numerous blood transfusions. There were four remaining brothers at this time and I’d bet rumors flew around town concerning their antics because one story that filtered down to John and me concerned our father and his pursuit of a fair lady. Apparently, a contender tried to enter the arena and Dad tossed a half stick of dynamite under the poor fellow’s porch. I don’t know the truth—maybe he tossed a few barrel bombs–but it makes a great family story. Jim Grace was described as a dedicated hunter and fisherman and seemed to be loved by all. Because Jim was a Cal man and Tom was a Stanford man, there was the stuff of great intra-family rivalry every Big Game. Bill Geary recalls Jim as a big guy…and a close friend of his Uncle Finlaw. Finlaw Geary was a local attorney who died in 1951 at the age of 62 and was a close friend of the Grace family throughout his life. He may have had to use his legal skills on occasion on behalf of his five buddies. The years from 1930 to 1940 were full of change and loss for the brothers, beginning with their father’s death in 1930. Prohibition ended in 1933, the beer can was introduced in 1935 their mother passed away in 1939 and Moses in 1940. Most importantly, the five boys operated the many commercial enterprises with their uncle, Joseph T Grace. It must have been a challenge for these young men to bring the brewery back to production and manage all the lands with the nation still in the midst of the Great Depression. The beer business was a vastly different business from the one Frank P and Joe Grace had left in 1919. The big breweries exerted their influence on the market place. The last part of the 19th century saw the expansion of these breweries, mainly through the use of refrigerated railroad cars that extended the territory and forced intense competition. Breweries were forced to buy saloons that were tied to their beer to control the local market, and then later expanded into new markets. As many breweries opened, an equal number closed. In many ways, it was similar to America just prior to the micro-brewing revolution in the 1980’s. For every brewpub that opened then, it seemed one closed. Microbreweries seemed to either close or be absorbed by a larger (read Budweiser) brewery. But when the boys reopened the brewery in Santa Rosa, they had an excellent local market to supply, but they saw the need to expand so they could grow and continue to modernize. They did this for another 33 years (with a brief recess from 1953-1958). And thankfully they did. By the time they were again producing beer in the thirties, they supplied it from Eureka to the San Joaquin Valley. They even shipped 1,000 cases to Honolulu in May of 1933. The brewery employed 30 men. Jacob Blum was the brew master until his death shortly after Prohibition ended. Henry Fischer, who stayed until 1938, replaced him as brew master. Frank P (Moses) was president, as befitting the oldest of the five boys. Tom was vice-president and Jack secretary/treasurer. Grace Brothers landed a contract to bottle the new product called Pepsi Cola. They also bottled other soft drinks, including Whistle, Howdy and NuGrape, under our own label. They used the bottling line in the brewery to produce the soft drinks. I don’t have the particulars on the Pepsi contract, but obviously we stayed with beer and Pepsi seemed to survive without us. The old expression “if, coulda, shoulda “ comes to mind. Oh, well, soda rots your teeth. The brothers continued to add to the brewery and to modernize the capacity to brew more GB. Lying fallow for fifteen years did not do much for the brewing equipment. Because they needed to get up to top speed quickly in order to compete for business, a new cellar was finished in 1934 and a new brew house in summer of 1935. The brewery was set to compete with other regional breweries such as Olympia, Lucky Lager, Burgermeister and Hamms. One way was to create so-called “designer labels.” The brewery designed different labels for the same beer–kind of a 1930’s version of contract brewing. These beers could be sold side-by-side in stores at different prices. Labels were created for grocery stores and liquor stores who ordered a minimum case requirement. As all of us grew up, we faced many questions about the various labels and how many beers we actually brewed. It made for some great stories. Just about this time a revolution was brewing (Couldn’t resist that pun.) that would change, literally, the face of the beer industry. The beer can was marketed to the public. Many attempts had been made in the past to use cans but the taste was always spoiled by the metal of the can. This problem was solved by lining the can with vinylite, a malleable plastic, invented by Union Carbide. Krueger Brewing Company of Newark, New Jersey volunteered to use their company to test this new product. No brewer was eager to market it in their local market so they sent it to outlying areas. It succeeded in Richmond, Virginia and the beer can became part of brewing history. Both Continental Can and American Can Company supplied Grace Brothers with cans as the brewery initially followed the others and marketed outside its core market–even to Sacramento and Eureka. The first labels were Excel, GB, Nu-Deal, Cremo and Monogram. The cans came in flattop and cone cans. The flat top won out and the cone top became yesterday’s news and the beer can collector’s delight. The early cans had instructions on the side of the can, showing how to open the can and, of course, the can opener became a must-have kitchen utensil. At some point, “church key” became slang for a can opener. Certainly by the 1950’s the term was used, particularly by the younger crowd. Aside from joining the other brewers in canning beer, Grace Bros busily purchased other California breweries from 1937-1942. For a period of time it appeared that Joe Grace and his nephews were set for a long and successful career in brewing and selling beer. They bought Rio Brewing Company of Los Angeles, in April 1937, renaming it Grace Brothers Ltd. of Los Angeles. Joe was president and owned the majority of stock and Frank P. Grace Company (the five boys) owned a minority interest. This was the beginning of Grace Brothers in LA, and Joe owned the operation into the 1950’s. Joe Grace was a very good and experienced businessman (He was 55 when his brother Frank P died in 1930). As we shall see this was not an arrangement that was destined to last, and by 1946 the boys and their Uncle would be totally separated. In 1941 they had added to their brewing empire. Joe purchased Monarch Brewing Company of Los Angeles and the rights to 47 brand labels (among them Balboa, Golden Bear and Old English Ale). These two acquisitions allowed them to supply beer from San Joaquin/Merced County to the Mexican border and north to Eureka. This enhanced distribution range increased market share in California. Remember, the giants of the industry had not totally dominated at this time. Even though, as we will see later, tastes were changing, there still was demand for regional beers. The combined Graces Brothers Ltd of Los Angeles and Grace Brothers Brewing Company of Santa Rosa acquired an interest in Buffalo Brewing Company of Sacramento in order to brew beer for the Sacramento Valley. Joseph T. Grace became president of Buffalo Brewing Company. In addition, he purchased Fresno Brewing Company in 1942 and became president of that brewery and the nephews became shareholders. Joe was a busy man with great determination and insight. 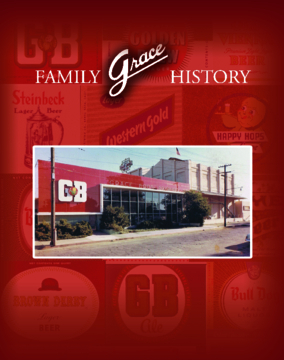 At this time, Grace Bros Brewery was the fourth largest brewery in California, trailing only Maier, Burgermeister and Lucky Lager. Grace Bros was a large player in the brewing community with the acquisition of Rio, Buffalo and Fresno. It seemed destined to continue to continue to expand–at least in early 1942 it did. However, as mentioned above, the relationship between the boys and their uncle was not destined to be long-term. On New Years Eve of 1942, Joseph Grace sold his interest in Grace Brothers, Santa Rosa to his four nephews, and he took total control of Grace Brothers Ltd. of Los Angeles, Fresno and Buffalo. Joseph Grace died in 1957 in San Francisco after losing his brewery to bankruptcy a few years earlier. I have little information on how and why Joe last the brewery but can only guess that the market conditions and competition forced the sale. Bill, though the youngest, became president of the Santa Rosa brewery with Tom as his vice president and Jack as secretary (Jim was in the military service at this time). As part of the separation agreement, California was divided at the San Joaquin/Merced line, and the Santa Rosa Brewery could ship to Eureka from the line and Joe’s Los Angeles enterprise could ship south from that line to the border. All the breweries continued to brew under the GB labels. They created the names Southern and North Bay to distinguish the two for distribution and legal purposes. That New Years Eve of 1942 at the Grace house on McDonald Avenue must have been quite an evening. I have never been privy to the details or the whys of this breakup, but it seemed to suit both sides. Joe continued with his many financial activities, as did the Santa Rosa Graces with their land purchases and various other business enterprises. I suppose the wartime shortages of malt and other restrictions caused problems and perhaps operating of breweries up and down the state probably taxed resources. Perhaps the age difference and business experience gap was too much to successfully close. Joe was thirty years their senior and had accumulated a tremendous amount of business experience. Sometimes a gap in age and experience can be insurmountable. Whatever the reasons, separated they were and each continued for a number of years to be successful in the beer industry. So by 1943, the four brothers were in charge of the Santa Rosa operations and supplied beer as far south as the Merced County line. In 1946, Joe sold the SR Ice Delivery and Railroad Company to the brothers for $16,000, and both Buffalo and Fresno agreed not to use Grace Bros on labels or crowns. The relationship was totally severed at that time. Joseph Grace actually purchased the Buffalo Brewing Company in 1944 and became the sole owner of Buffalo Brewery, Inc. Grace Brothers in Santa Rosa no longer brewed Buffalo Beer for the Sacramento Brewery. Also in1944, Grace Bros. registered the “Happy Hops” name and logo that became a distinctive trademark for the Santa Rosa Brewery. The logo was in cement in the sidewalk entrance to the brew house. I remember a local man telling me in 1978 while he sat at the bar at Fiori-Grace that he had cut this Happy Hops logo out of the cement and tile in front of the brewery and had put it in his patio. It must have been important to him. December 7 1941 woke America from its isolationist stance, and the country jumped into battle with the Japanese and the Germans. The whole nation got into the war effort. The brewing industry was asked to do its part. Breweries were put on a malt allocation, and a general shortage of materials limited production. In addition to these conditions, canned beer was reserved for the military. Drinkers at home had to be content with bottled beer. Many G.I.s came home from the war thinking beer only came in the color olive green since that was the only color with which it was canned. I am certain that long-distance travel and lack of refrigeration did not help the condition of the beer and probably left many a soldier with a bad taste for beer. Interestingly, the tastes of beer drinkers changed after the war for a myriad of reasons: women joining the work force, more homogeneity in taste because of the effect of mass marketing and possibly even a desire for something different from the beer the GI’s drank during the war. The trend toward a lighter beer continued for quite a while, as we shall see. A picture of Uncle Jim in his army uniform (see appendix) appears in the Press Democrat article of February 18, 1943 written by Herbert Slater, the ex-California legislator who, though blind, wrote for the PD for years. He wrote “…The news was startling as it spread throughout the community and there was no one on hand to say anything but a good word for Jim…it was just like Jim to request that he be relieved from division headquarters duty…in order to get into the heart of things and aid in winning the victory”. Uncle Jim was a community man and a patriot, and he gave the ultimate sacrifice. Now there were three Grace boys left. Jim died at age 37–just like Moses. Too, too young for both of them. It is a pity our generation never got to know Jim and Frank Jr. After reading the newspaper columns and researching their high school careers, I feel like I have a better sense of them. Both seemed to have many friends, and their deaths were a loss to the community. The early 1940s must have presented quite a challenge to the three remaining boys. After buying and selling three breweries from 1939-1942 and after separating from their uncle and going out own their own, they were still relatively young. Tom was the oldest, not yet forty years old in 1942. The boys had experienced a great deal of tragedy and had much responsibility thrust upon them at such a young age, but they handled it admirably. Like all Americans, they looked forward to the war’s end and some sense of normalcy to return. After the war, the brewery again was remodeled to a new appearance of enameled metal, plate glass front (of bottling house), and red tile building face. The capacity in early 1947 was 120,000 barrels of beer/year (approximately 1,000,000 cases of beer). A new bottle shop opened with a capacity of 260 bottles a minute that produced 600 barrels a day. The brewery could bottle 8, 11, 12, and 32 ounce bottles on this line and could also fill cans–both flattop and cone-top. A new warehouse was added to the back of the bottle shop (95’x 210’ – according to John Burton) and stood three stories high. Beer was handled on a pallet system, utilizing a forklift much the same as when my generation worked in the brewery in the 1960’s. A railroad spur ran in front of the brewery that provided easy access for raw materials and distribution. The brewery made every effort to maximize the plant and meet production needs and remain competitive. It was to continue to be a struggle for a number of years. Some time during 1947 and 1948, the infamous Tap Room was completed. It was furnished with a world-class German beer stein collection and captain’s chairs with an “ always full refrigerator” – full of GB of course. Part of one of my summer jobs was to fill that the refrigerator at the end of each day so that the many service group or coaches’ groups, etc. would have an ample supply for their “get-togethers.” The Tap Room still holds many memories for our family and for a few generations of Santa Rosans. It was there that the North Bay Coaches held one of their yearly meetings. Lions’ Club and many other clubs gathered there, and the room was always open for friends to stop by and help themselves to a beer. Countless people have stopped Jim, John and me over the years and told us that they remember the hospitality extended to them at the Tap Room. Others would inquire the whereabouts of the beloved stein collection. “Which one of you boys got that?” they would ask. The answer is a sad narrative to be explained later. If anything epitomizes the generous nature of Tom Grace, it is the Tap Room and the warmth and hospitality he extended on a regular basis to the people of his hometown. On more than one occasion, I recall seeing some of our civic leaders having a few brews in the Tap Room. As hospitable as the Tap Room was to Santa Rosans, the beer industry was not to regional brewers–not that the industry was ever kind. Pabst, Miller, Budweiser, Schlitz and the other major breweries feasted on the small regional breweries as they greedily gobbled up market share and eliminated some competition. Advertising dollars were increased nationally as the major brewers battled and pushed their brands. Beer consumption dropped in the 1950’s from 18.5 gallons/capita in 1950 to 16.9 gallons/capita in 1951. For the remainder of the decade, consumption stayed flat (one last pun). In comparison, from 1950-1960 American industrial output as a whole increased 54% and per capita income increased 35%. As the market got more competitive, regional brewers decreased in number and only the corporate giants seemed to thrive –or maybe just survive. The number of Americans between 20-40 years old (prime beer drinking age) also declined, and fewer of them consumed beer. Liquor was in short supply during the war but not in the 1950’s. The liquor industry amped up its marketing efforts and created a mass marketing campaign to attempt to dominate the alcohol industry. As a result, brewers were forced to fight “cocktails” for the drinker’s palate. Additionally, the combination of a diet craze that swept the nation at that time and the trend toward lighter lagers (considered sweet and bland by many), the beer market suffered considerably. Actually, the beer market was bifurcated with the national beer machines growing and the rest fighting to exist. However, tastes did change, and the breweries had to adapt in order to survive. The light beer revolution was just around the corner and “light, pale and dry” seemed to describe most major brands. Not until not until the baby boomers fed the micro-brewing revolution in the mid-1980’s did beer-brewing America return to its roots of full-bodied ales and lagers. In fact, the president of the Master Brewers Association of America urged his membership to brew “modernized.streamlined beers with a pale color and a mild hop flavor…” The brewing industry understood this change and urged brewing for public taste and not their own. Ironically, a few years later (1967), Meister Brau of Chicago produced the first “lite beer.” So the beer market became rife with troubles and extremely competitive as breweries tried to hang on. In 1953 Grace Brothers Brewery had to close its doors. There was a rumor of a sale to Hamm’s Brewery, but that rumored sale fell through. The early 1950’s were rugged times financially because of high labor costs and the fierce competition for beer sales. The Grace family continued to farm the various ranches and it subdivided the area currently called the Grace Tract. And it would be five long years before the doors to the brew house would again open. As a means of measuring the change in the beer market, it’s necessary to understand that 211 beer makers operated 252 plants in 1958 and the four largest brewers owned 18% of the market. By 1967, 124 breweries operated 183 plants, and the top four accounted for 33% of sales (Bud, Schlitz, Pabst and Falstaff-Miller was #8). Out of that group, just Bud and Miller are left. Phillip Morris bought Miller in 1969, and the race was on–at least for the major breweries. Actually, Pabst was resurrected and is still brewed today. It enjoys a loyal following-particularly on college campuses. They brew approximately 25 beers including Pabst, Primo Schiltz, Old Milwaukee, Ranier and other regional brands purchased by Pabst. But, alas, Pabst too has been sold just closing the last week in June. The new owner, C. Dean Metropoulos , bought the brewery for a business for his sons to run. Let’s hope they continue to satisfy their loyal, cost-conscious following. As for the land of Happy Hops, Grace Brothers reopened on April 1, 1958 and negotiated a contract to produce Bull Dog malt beverages for Bohemian Distribution Co. of LA. This contract and our “designer” labels allowed Grace Brothers to survive another seven years, until1965. The brewery produced 332,500 cases a year of Bull Dog. When the brewery started producing beer (mid March 1958), it hired 40 employees – many of them former employees. Tom was president and Jack was VP and secretary. I remember this time period clearly: rides on Saturdays and Sundays to the brewery while Dad checked out the plant and allowed my brothers and me to run around, drive forklifts and generally amuse ourselves. But as good as the resumption of brewery operations sounded for Grace Brothers, the marketplace did not. It had gotten more vicious. Bohemian Distribution Company bought Grace Brothers’ Brewery LTD of LA out of bankruptcy in 1956 and renamed it Southern Brewing Company. So the Grace Bros Los Angeles brewery was in outside hands and pressure increased for the “affordable beer” market-notice I did not say cheap. The Bull Dog contract was estimated to gross about $4 million for a five-year period. Bull Dog was available in four sizes: 8 oz., 12 oz., 16 oz., and 32 oz. It competed with Country Club Malt Liquor for the slightly maltier beverage market, a euphemism for higher-octane beer. Production at the brewery in 1958 was 100,000 barrels, and twenty-five percent of that was Bull Dog. Payroll was $25,000 a month for the 50 or so employees. At the time, Grace Brothers had one bottling and one canning line. Oscar Blum was brew master (he was the son of Jacob Blum, a former brew master at the brewery). Two years before the reopening, Bill Grace died on November 3, 1956 after a long battle with cancer. He had been sick for a couple of years with cancer. Family lore has it that Moses bought Bill his first house on either Alderbrook Drive or Talbot Avenue. Bill died before seeing the brewery reopen in 1958. I’m sure he would have pleased to see the family business flourish again. After high school, Bill had worked at the brewery and had served as an officer. He moved to Colusa after the closing of the brewery to manage the ranch there. He had earlier married Juliet Proctor and has three children Julianne (deceased 1971), Pam Grace Stone and Bill Grace. Juliet’s family was very involved in the hop business, so their marriage seemed like a perfect fit–brewery and hops. But they later divorced, and Bill then married Maryann Peterson. Bill died at age 45. With his death two of the five brothers were left. Jack was 48 and Tom 53 at the time, and both had young families and a lot of real estate and an outstanding regional brewery that was fighting tooth-and nail to keep its head above water and compete for the beer dollar. Just after the brewery reopened, Jack Grace died unexpectedly on December 29th 1958 of a heart attack. He was attending a party at the house of Ed Healy, a close friend. Jack had married Emma Shea Hughes on July 17th 1937 and had four wonderful children: Patricia, James, John and yours truly. Jack worked at the brewery and at the Healdsburg ranch. He had just turned 50 when he died. Pat Grace Fitzpatrick remembers mourners at his funeral were so many that they filled the chapel of St. Eugene’s and stood on the entrance steps. She said recently that she didn’t realize how many friends dad had. While this history isn’t the place for personal memories of my father, I will say that he did love his kids and that he was a softie. I know that I developed the habit of reading the sports pages each morning because of Dad. He always read the Sporting Green, and we would talk about what was going on in the sports world. His Buick convertible was the favorite car of many of our friends because dad would pile us into the car with the top down and take off for the brewery or other places, and we would squeal with delight as we rode the streets of Santa Rosa. I recall looking through his papers that mom kept and noticing many personal notes from people he had loaned money to that remained uncollected of course. Like his brothers, Dad had a soft spot for someone in need. I have not found concrete reasons why Tom and Jack decided to reopen the brewery since, if anything, competition when they did was more severe than earlier. I remember talking to Virginia Grace about the brewery at the time I had hoped to start Grace Brothers again. She remarked that the business was always difficult, and she couldn’t understand why anyone would want to get into it. Her remark echoes the thoughts of Fritz Maytag of Anchor Steam Brewery in San Francisco. When I met him at the brewery during a seminar there in 1985, he said, “Why in the heck do you want into this crazy business?” or something similar. Despite his misgivings, he was a wonderful source of information and a true gentleman. At that meeting, he told me how Grace Brothers and Anchor Steam were once connected. When Maytag bought Anchor in 1965, I believe, he asked Tom for some help and came to Santa Rosa for some yeast starter to begin the brewery. Tom gave him the yeast in a bucket, and he drove back to San Francisco in his convertible with the top down. During the drive he looked back and realized that the yeast was actively working and foaming over the top of the bucket and billowing down the freeway. A great guy and a great story. So I guess we really are part of Anchor Steam. Dad’s death left but one Grace brother to shoulder the load of running the brewery, the ranches and of finding a way to support the widows and nieces and nephews. Considering the situation in the beer industry with the tremendous competition and high wages, it was an ominous task. And just one year earlier, Tom and Dad had reopened Grace Bros. Brewery. But Tom steamed ahead and went about upgrading the brewery and expanding markets and managing the various agricultural interests. By 1959 Tom employed two shifts to double production, and the payroll went to $40,000 a month. Fifty percent of the production was in private labels (Acme, Bull Dog, Brown Derby, etc. (See the appendix for the various labels and John Burton’s research on the numerous Grace Bros. labels). The brewery was capable of bottling 260 units a minute, and it paid close to $1,000,000 in taxes a year. In 1960, production was increased to 500 cans a minute with a new high-speed filler. In 1964, the annual payroll was $602,000 and federal taxes were $1,380,870. Total sales were $5,158,167 for 154,000 barrels of beer. However, the Santa Rosa institution of Grace Bros. Brewery could not resist market pressures and was forced to close. The combination of those pressures, the high cost of production, and the demands of family finally caused Tom Grace to sign an option in 1965 with Joseph Kalmanovitz of the Maier Brewing Company of Los Angeles to purchase the brewery. Tom was to have his job of president as long as he wanted. But it wouldn’t be for long. Tom Grace passed away September 22, 1966, and one month later Kalmanovitz closed the Santa Rosa brewery. He opened it one year later under Maier Brewing Company and then closed it for good in 1969. The equipment went to Maier in LA, and the building was declared unsafe and torn down in 1969/1970. As far as the brewery Kalmanovitz exercised his option that Tom negotiated and in October 1966 there was a new owner of Grace Bros. Brewery, a Santa Rosa institution from 1897 until 1966. The cans had Grace Brother’s Brewing Company and Maier Brewing Company on the sides. Maier was responsible for bringing out the one-gallon cans (see enclosed picture of John, Kathy and me on the front porch at Chico 1969). Kalmonovitz finished his last brew in 1969 and set about demolishing the brewery. I remember going onto the property to take pictures of the brewery and being chased off by a guard with a dog and a shotgun. Not a warm fuzzy farewell. This was also the time when collectors raided the office and the brewery and took much of what was of value. It struck me as slightly ironic that a few years later these same folks would phone up and offer to sell me some of their “GB stuff”. Probably should have bought some but that darn old family pride got in the way and I said “ The hell with them”. One of the biggest regrets the four of us (Jim, Bill, John and myself) have is that Kalmanovitz gave the Tap Room steins, tables and chairs and anything else that was in there to a Safeway salesman. I think that just added insult to injury. Bill did get out with one of the tables-a wooden keg with a red formica top. Apparently the Safeway salesman threatened Bill to no avail. Looking back I know that if it was in the contract that’s the way it goes. The trade fixtures go with the sale of a company unless indicated but at twenty it didn’t go down so well. In retrospect, it is easy to the reasoning for the sale given the market condition and the financial needs of the various members of the family. Plus, the strength of the unions and the fact that our beer was a Bavarian lager with a pronounced hop aroma- it definitely was not Coors or Olympia. Again, a few years later and we would have been in the middle of the micro brewing revolution. I guess I am proud that we didn’t resort to brewing bland, market-friendly beer. And I like Tom’s response when I asked him what he thought of the new “ fliptop” beer cans (pop-top) when they first came out. He said that if a guy couldn’t open a beer with a can opener he shouldn’t be drinking it. Prosit! Tom continued to increase efffiency and added equipment in the struggle to compete. Grace Bros survived as long as it did survived because it brewed private labels for Safeway, Purity, Lucky and other supermarkets, and for some of the larger liquor stores. All the beer was the same except Bull Dog Ale and Stout and GB Bock beer. (A bock beer is hoppier and caramelized malt is added for color.) The various cans were different in appearance, which caused much confusion and not a little humor around town. Still, some local folks had their favorite beers and believed Grace Bros. brewed many different ones. I remember being told by an older friend (older being probably 22) when I was in high school that Brewers Best was the best beer Grace Brothers made. I knew it was all the same so, wondering what to say to my friend, I asked Uncle Tom what to say. He said, “ Tell him that he is a great judge of beer”. Lesson learned! Bull Dog Malt products supplied, according to John Burton’s figures, 25% of the sales and Graces Bros. kept us afloat for a while. I asked brother Jim once if he remembered tasting Bull Dog, but he doesn’t. However, with the high alcohol content that is possible. The period from 1958-1966 was a time of pure struggle to survive as far as I can tell. With Tom the last of the Grace boys, he had the responsibility for large and extended family. Bill Grace’s second wife, Maryann, sold her share of Uncle Bill’s estate, and that produced additional financial pressure since there was now ownership outside the family. I am sure they wanted a return on their investment. I believe they paid $10,000 for Maryann’s share. The history of the Grace family is a history full of business adventures and community involvement and pride. The athletic achievements of the five Grace Boys was an impressive record. As is probably obvious, I have always been proud to be a member of this family and continue to be so. They were all good people who treated their fellow Santa Rosans with respect and I believe that respect was mutual. If I had a dollar for every time one of us lamented we weren’t able to keep the brewery going or keep the Healdsburg ranch until the grape boom, I would be a rich man. We could have joined Fritz Maytag with his rejuvenation of the Anchor Steam Brewery. In the 1970’s the Baby Boomers were demanding quality beers, home brewing was very popular and import beer was the rage. Looking back on Becks and Heineken, they weren’t such good beers-but they were different and they were the rage. Remember now, these beers had already traveled 60 days on a ship to get to America and then they were shipped across country. So, fresh they were not. Skunky, stale and flat. Hey! Paul Newman drinks Heineken, it must be good. There was a tremendous demand brewing for something other than the bland product the big brewers were putting out. Younger people were looking back to the past for craftsmanship in many areas so it was a natural for this movement to capture the imagination of home-brewers and entrepreneurial sorts. The Congress passed a law allowing the sale of beer on site and brewpubs began jumping up all over the nation. By the mid 1980’s the micro-brewing revolution was roaring. Fritz bought Anchor in 1965 but it took him a few years to get the process down and quality up. But he did get quality and of course he had good old GB yeast to get things started. As I stated above, Fritz told me I was crazy to think about getting in the beer business…but he said it with a slightly whimsical look. A sentiment, I might add, that was shared by many in my family-including Aunt Virginia. Fritz created what is widely acknowledged as one of the best beers on the market. It took him many years to make a profit but he made it. A real pioneer and one of the really nice guys in the business. All this revolution needed was a few wild-eyed dreamers and John and I visited the first of these dreamers-Jack McAuliffe with his New Albion Brewery in Sonoma. It opened to the public in 1977 and we visited him about a year before it went under-1981 or so. He was a gruff no-nonsense guy who built his own equipment and had no sympathy for anyone who could not do the same. The beer was good but was bottle conditioned, which required more delicate handling by retail outfits, and he insisted on returnable bottles-which was a nightmare and he probably suffered from some consistency problems. But Jack started the craze (one of the owners of Sierra Nevada is rumored to have been an apprentice there) and hundreds of small brewers followed. Some thrived, most dived but rest assured that folks looking for better variety and more traditional beers loved the quality of beer that was being produced. Would Tom have wanted us to get back into the business? Well that is a good question but I believe he did all he could to convince us to go to college and pursue other interests. For my part, the reason I did not, after spending the better part of two years pursuing it, was that I could not figure out how to make it profitable. Pretty elementary. Write a business plan after very extensive research and then make the educated decision. My accountant said, “ Go ahead with this idea but you will lose everything you have and all the money you raised from your friends in this town.” I had figured out how to get the equipment and had taken a brewing class at UC Davis and had a good idea of the whole process…but I could not get past the fact that I could not make my business plan forecast a profitable business. I did love being at the epicenter of the micro-brewing wave and I am a so glad folks like Ken Grossman at Sierra Nevada prospered. And if it was possible …. By the way Ken Grossman told me when I visited him in Chico in 1985 that he did have one advantage being in Chico-an endless supply of cheap labor and a ready market for his beer. He couldn’t have made through the first year without those kids. Still there beats in the hearts of a couple of generations of Grace Boys a thirst for a brewery. So I guess we are damned to just drinking it. Not so bad. The Grace Family History is also available in print. Link to purchase here.